Vidya Balan was born in a South Indian Iyer family in Kerala, but later shifted to Mumbai while she was a young girl. She did her schooling form St. Anthony’ Convent School and graduated from St. Xavier’s College. She even went on to do her masters before enrolling into Prithivi Theatre’s workshop for acting course. She acted in very popular television series “Hum Paanch” and appeared in several musical videos before venturing into films. Her debut Hindi movie “Parinita” was a huge success and her acting was critically acclaimed, which earned her the Filmfare award of best Debut actress. Later, she acted in a number of movies on different genres and proved her versatility as an actress. Today, Vidya is the most acclaimed actresses in tinsel town. Vidya is a beautiful girl with typical Indian features. She is brave enough to appear off screen without makeup, whether it’s for a film screening or at the airport. Here I present some of the best vidya balan pics without makeup. 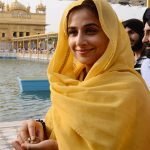 Vidya had visited the holy Sikh shrine to pray for the success for her upcoming movie, “Ghanchakkar” opposite Emraan Hashmi. 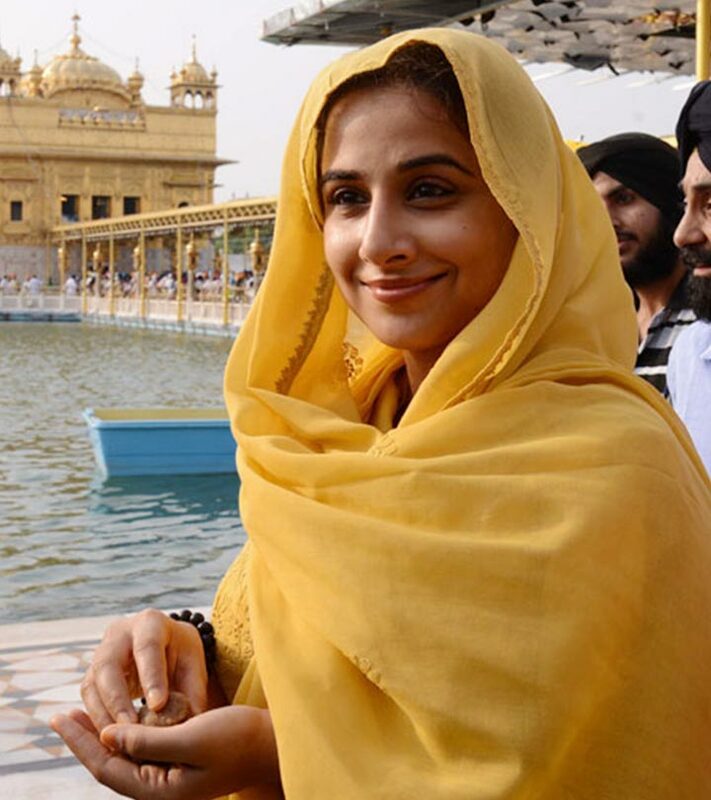 She visited the city to promote her film and later went to the Golden Temple to take blessings from the Lord. Vidya looked divine in a yellow suit; the colour yellow is making her appear more beautiful even without makeup. 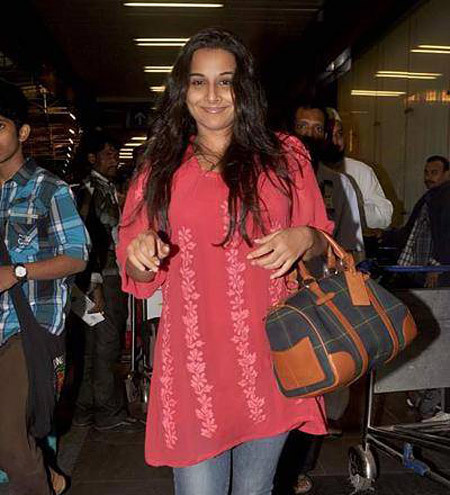 Barring a hint of kajal, Vidya went makeup free for her flight to Mumbai from the recent Cannes Film Festival. She wore a brown dress with a long black shrug over it. She carried a brown bag with it and tied her hair in a plain bun. Vidya was accompanied by her husband Siddhartha Roy Kapoor and was captured flashing her demure smile for the shutterbugs. This picture was taken at the special screening of “Kahaani” which was held in Ketnav, Mumbai last year in March. 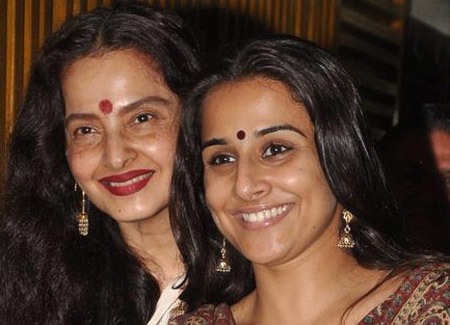 Vidya was snapped with veteran Bollywood actor Rekha who surprised or rather shocked everyone with her non makeup look. Vidya too, attended the premier with minimal makeup, just a stroke of kajal and a dash of lip-gloss on the lips. She was at her simple best, dressed in a black suit with a printed dupatta to break the all black monotony. The following picture was taken at the screening of Mandira Bedi’s “Anything But Love”, which was held at PVR in Mumbai. Here again, Vidya adopted a complete traditional look in a white Chikankari Salwar Kameez paired with a black and white dupatta. Her face is again sans any makeup with just a hint of kohl in her eyes. The look is too plain for a celebrity of her stature. 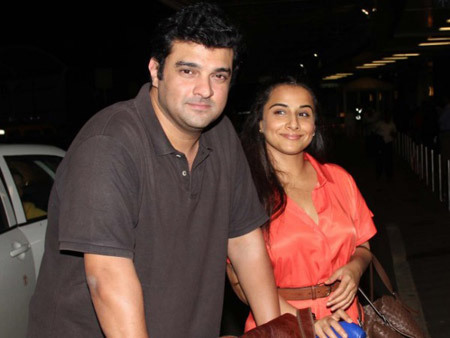 Vidya Balan was spotted leaving Mumbai airport in 2010 with Siddharth Roy Kapoor who came to see her off, sparking off controversy of her relationship with him. She later admitted to the paparazzi of her relation with him. She again opted for a no makeup look for the journey. She looked all bright and cheery dressed in red loose top and blue pencil jeans. The picture was taken at the premiere of her recently released movie “Ghanchakkar” where Vidya arrived in a very simple and traditional look. She wore a red wine three quarter cotton kurta paired with a white churidar. She looked very elegant and sober in this ethnic look. But her face looks a bit dull this time sans makeup. She should have applied a tiny bit of concealer to hide her dark circles. Bollywood celebrities like Shahrukh Khan, Madhuri Dixit, Preity Zinta, Ranbir Kapoor, Jacqueline, Vidya and several others were spotted at the Mumbai International Airport leaving for IIFA 2013 which is being held in Macau, China. Vidya was accompanied by her husband Siddharth for the trip and looked very pleased and happy while posing for the camera. She looked very relaxed in a peachy orange calf length dress, paired with a tan bag and tan sandals which is going very well with the outfit. 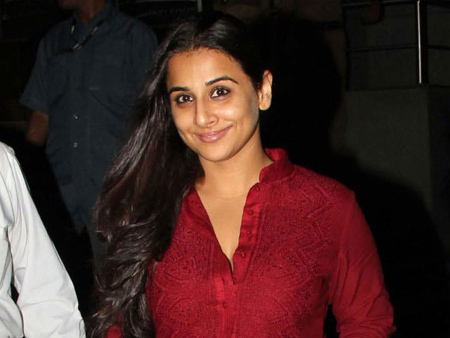 Overall, Vidya is looking very fresh and vibrant in this no makeup look of hers. 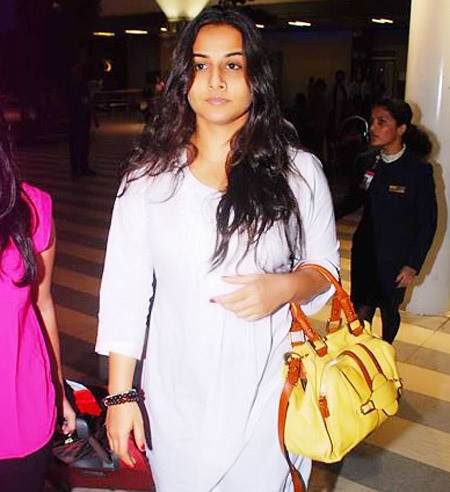 Vidya Balan was snapped at the Mumbai airport leaving for the IIFA 2012 which was held in Singapore. It is said that Vidya left for the award ceremony at the last moment with Boman Irani. 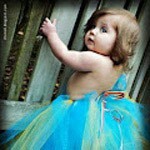 She was dressed in a comfortable white tunic which she paired with black leggings. She left her hair loose and carried a yellow Gucci tote to stuff her essentials. She looked quite relaxed for the journey sans makeup. Veteran director Yash Chopra, also known as the “King of Romance” succumbed to multiple organ failure and passed away last year in October. The entire film industry paid their respect by attending his funeral at Pawan Hans crematorium. Amongst those present were, Amitabh Bachchan, Deepika, Priyanka, Rani, Kajol and several others. 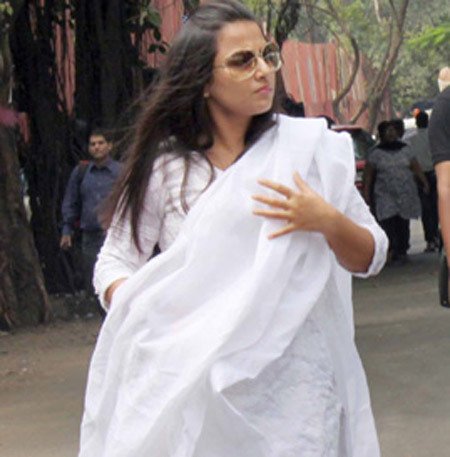 Vidya arrived there in a simple white salwar Kameez, vey appropriate for the occasion. 10. “Parinita” actress was snapped this year in May leaving the residence of actor Sanjay Dutt. The entire film industry flocked the Dutt residence a day before his surrendering to the TADA court. The supreme court of India ordered him to report within four weeks in a case linked to the deadliest terror attack in 1993 which killed almost 300 people in the financial hub of Mumbai. 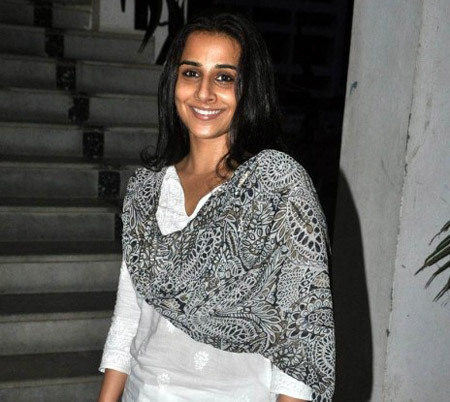 Vidya, who had worked with Sanjay in “Parinita” and “Lage Raho Munnabhai” was the first one to arrive at the actors’ home. So whats you decision on these Vidya Balan without makeup photos? Leave us a comment!